LDUCZ-G105 Care to guess what it is. A sea pen, barnacles? If you check our specimen of the week widget, where you can see all past specimens of the weeks the vertebrates, in particular mammals, still dominate despite being a comparatively small group of animals. This week I’m going to focus attention on a far less furry or ferocious invertebrate animal because let’s face it they just don’t get the PR the Hollywood Animals do. If you ever whiled away an afternoon at the beach rockpooling, you’ve undoubtedly come across these animals but may not have noticed or recognised them. 1) Worm with a shell Us land-dwelling mammals tend to think of worms as the soft squirmy kind which create problems when aggregated in cans. The earthworms that we’re used to are but one kind of worm, there are many different kinds of worms- some with fierce jaws (the so called Bobbit worm can cut fish and coral in half), some which don’t look like worms at all and worms which create their own shells and tubes. 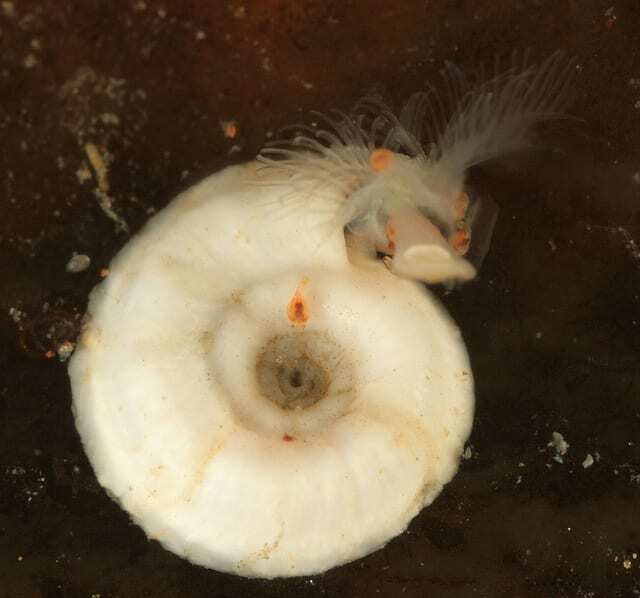 Spirorbis which we have here is a serpulid, annelid (segemented) worm which create their own spiral shells which they can close with a specialised tentacle, the operculum, like a little door, which they can use to ‘close’ their tubes to protect themselves from predators and drying out. Spirorbis attach themselves to a substrate and filter feed with their tentacles. 2) The Spirorbis falls far from the tree The larvae of Spirorbis are shell-less and free swimming until they settle on a suitable substrate and then start to grow a tube. Spirorbis can be found all around the British coast, attached to rocks, stones and as with our specimen here, seaweed. Studies on whether seaweed-preferring Spirorbis larvae have a preference for where they settle have shown that they tend to avoid settling in areas densely populated by adults but get less picky the longer they go without finding a suitable place to settle down (Wisely, 1960). 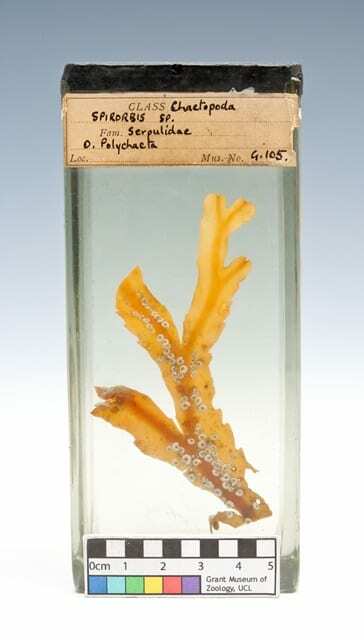 There is also a tendency in species which have been observed for larvae to settle nearer the midline of seaweed fronds, which this specimen demonstrates perfectly. 3) Mother worm Spirorbis are hermaphrodites, possessing both male and female parts and able to release both sperm and eggs. A surprising fact perhaps is that these generally small worms, only a few millimetres long, brood their young before releasing them as free swimming larvae. Fertilised eggs are brooded within the tube or in some species within the operculum tentacle before being released as bright young larvae prepared for the big world ahead of them (Potswald, 1977). 4) Flood survivor? This unlikely group of worms have been fought over in the battlegrounds between scientists and people who believe that the biblical flood was a geological event that we find preserved in the fossil record. Today, Spirorbis are exclusively marine animals, however, fossils identified as Spirorbis were known from Carboniferous coal measures, encrusted on terrestrial plant material. Supporters of the biblical flood theory suggested that this was direct evidence of the flood event as when the waters covered the land, opportunistic marine creatures like Spirorbis quickly colonised submerged terrestrial ecosystems which were subsequently turned into coal. It wasn’t until the 20th Century that closer study of Spirorbis coal measure fossils were identified as different animals completely, enigmatic Microconchidans, which were physically similar in appearance to Spirorbis but able to live in brackish and freshwater environments. 5) Needs more research There are currently over 20 described species of Spirorbis, however, despite being an animal that is widely distributed along coastlines around the globe, many of described species are ‘fuzzilly’ defined based on obvious physical differences like tentacle colour or their preferred species of seaweed to settle on. 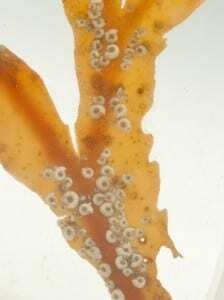 Our specimens here have settled on the fronds of a toothed wrack Fucus serratus which means that this is possibly the Northern European species Spirorbis spirorbis. The full number of species is anticipated to be much larger than the number currently described but there is a lack of taxonomic specialists working on this group of odd animals. Great post – many invertebrates are so interesting and I look forward to reading more about animals like Spirorbis. I find it fascinating that the suspension feeding of these worms utilises cilia and mucus that must have been retained from their unicellular ancestors. Evolution is certainly awe-inspiring…. Best wishes to all at the Grant.